A limited-budget product launch involving the education of consumers on the driving concept behind the product: a "healthy" gourmet coffee. Applied Food Sciences patented roasting process creates a rich, specialty-end coffee with more antioxidants than most green tea. The key challenge would be to communicate the healthful benefits of the product while asserting its rich, delicious taste (comparable to that of other specialty gourmet blends). The development of a brand name, logo, tag line, and package that instantly conveyed all the key elements of the new coffee in a synergistic manner. 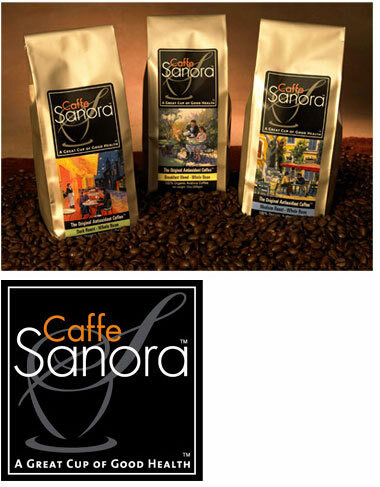 The brand name: Caffe Sanora (derived from Sano, the Italian word for health). The tagline: "A Great Cup of Good Health." The logo and package: Rich looking, custom-illustrated labels and attitude-capturing logo work together to create a package with a high-end, gourmet feel. Applied Food Sciences launched the product in Denver, Colorado and noticed an immediate positive response in the marketplace. The product was launched in several gourmet shops and supermarkets and has been featured on CNN, NBC, and the WB. The first Caffe Sanora coffeehouse opened in Denver in October of 2005.